Old fashioned copper kettles are used to craft our secret recipe into a delicious, creamy caramel that’s poured over crispy pretzels. The buttery aroma of hot caramel fills the kitchen as it pours from the kettle. 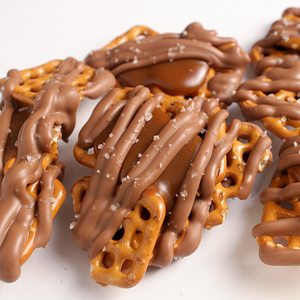 Caramel pretzels are dipped with the richest milk chocolate creating a delightful mixture of pretzel, caramel, and chocolate. Topped with a dash of purest artisanal sea salt, meticulously hand harvested from the shores of France, to enhance this combination of flavors into a true symphony of taste. A perfect snack packed in airtight re-closable bag.